Brackley Festival of Motorcycling is the show we will be attending this weekend! 1x Visor Cleaner Pack with Microfibre Cloth (£3.50) or two packs for £5! JUST LOOK FOR THE FLAGS! See you there! 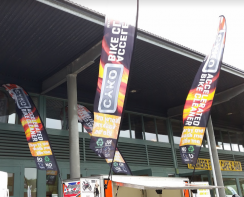 Trading over the weekend (21 - 22 July, 2018) at the new MCN Scottish Bike Festival at The Royal Highland Centre! Did you see us there? What did you think of the new show? Leave your comments and thoughts below!